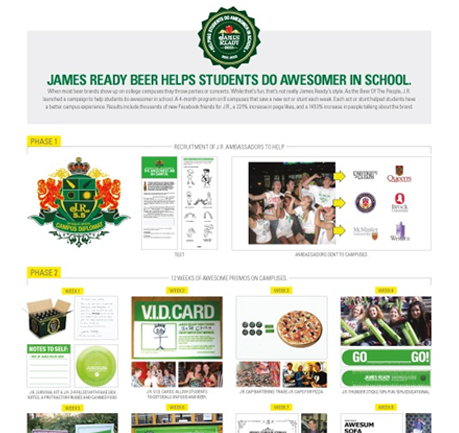 Building on past success within the Gen Y segment, James Ready was looking to develop a sustainable presence on major campuses. We recruited, selected and trained 2 JR Campus Diplomats per campus. Group interviews were conducted to find the best students that fit JR’s tongue n’ cheek, irreverent brand image. Over a 16 week period, JR Campus Diplomats competed to generate the highest impact on their campus. Each team was equipped with branded clothing and merchandise to announce their new role. Every week, teams went head to head to outshine each other based on weekly KPI’s established at the on set of the program. Tasks ranged from establishing “caps for free product” exchanges with local businesses, taking over homecoming with JR branded Thundersticks, hosting pumpkin carving contests, generating FB Likes and organizing bus trips to the beer store. Over 16 weeks thousands of new drinkers fanned J.R. on Facebook. In the first 30 days, page likes increased by 221% and people talking about the brand increased by 1453%. Despite having zero media support our reach exceeded 216,000.